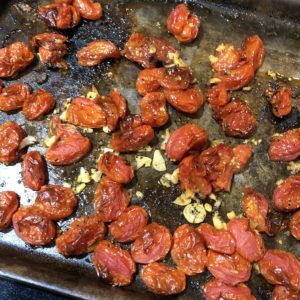 These roasted tomatoes with garlic were so easy and incredibly delicious. Like, seriously delicious, as in I couldn’t stop myself from eating them delish. Yum! I recommend making a lot of them as you’ll probably be finding reasons just to eat them. They’re a great side dish or even snack, and you really don’t have to feel guilty about eating them! Preheat oven to 450°F. Place aluminum foil over a baking sheet. Place tomatoes and garlic into a mixing bowl, Drizzle with olive oil, and toss until evenly coated. Season to taste with salt and pepper, then spread evenly onto the prepared baking sheet. Bake the grape tomatoes in the preheated oven until the skins pop and start to brown, about 17-23 minutes. If you make these, I’d love to hear what you think. Leave a comment below. Enjoy!